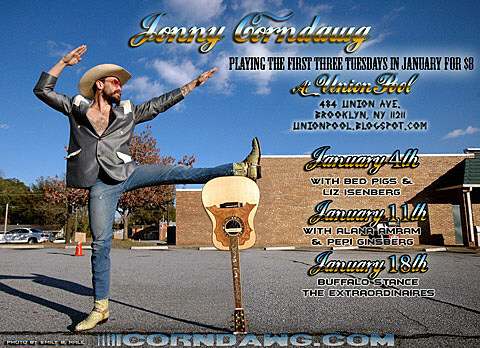 Jonny Corndawg will kick off a Brooklyn residency at Union Pool tonight (1/4). Fellow Deer Tick collaborators Liz Isenberg and Bed Pigs open the show. Bed Pigs = Deer Tick’s ex-guitar player Andy T (the guitar player before Ian from Titus Andronicus took over). Corndawg will also play the venue on the next two Tuesdays, bringing Pepi Ginsberg & Alana Amram on for support on 1/11, and Buffalo Stance & The Extraordinaires (who used to be Jonny’s backing band) for Jan 18th. Each show will cost you $8 at the door (and free blue Mountain Dew to the first 10 paying customers in the door). Jonny Corndawg celebrated the new year by posting a new track to his Bancdcamp page. The song “Down on The Bikini Line” is streaming below, but you can get a downloadable copy for the price of an email address. “Middle Brother to release debut album in March. Partisan Records is excited to announce that Taylor Goldsmith of Dawes, John McCauley of Deer Tick, and Matthew Vasquez of Delta Spirit have joined forces to make a very special record. The self-titled debut, recorded in January 2010 in Nashville, will be released on March 1, 2011. 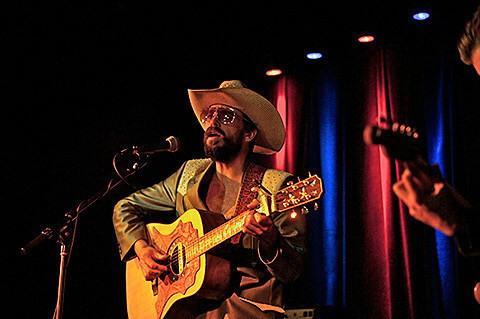 Jonny Corndawg also played with MG&V aka Middle Brother at that SXSW show, or to be more specific, he performed “Middle Brother” with the band. It’s a song he helped write which now shares a name with both the full album and the band. It’s track #4 on the new album and you’ll need to wait a while to hear it, but track #8, “Me Me Me”, can be downloaded now for free above. Pre-order the album at Partisan. Check out the full tracklist below. Middle Brother played their first show as “Middle Brother” on December 20th at The Troubadour in Hollywood. It was a holiday benefit with Cass McCombs, Mountain Man and Deer Tick also on the bill. They have no upcoming shows scheduled, but some will surely appear as the album release date gets closer.